This excellent little book delves into 11 issues that drove the Reformation, shows with clarity and precision how the Reformers differed from the Roman Catholic church, and demonstrates that the issues are just as relevant today as they were then. 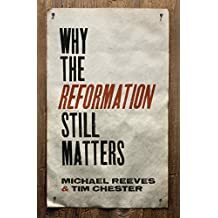 Very helpful for anyone wanting to understand why a Reformation was needed, what drove it and why the issues still matter. Also – an excellent and very understandable presentation of the differences between Roman Catholic theology and orthodox Protestant theology.